The iMod industrial computer is equipped with a variety of communication interfaces, which allow to connect any number of devices monitoring the operating parameters of a GSM base station (so called BTS). 1-Wire bus allows you to monitor temperature from any number of sensors - both inside and outside BTS. iMod can operate as a PLC. If temperature drops below a certain threshold, it activates antenna heaters - this prevents lowering quality and range of GSM signal. The sensors and heaters are also installed in engines in closed BTS rooms. The engines generate electricity if there is a power failure or such engines operate in an area without energy infrastructure. When the temperature is low, heating the engine in the start-up phase reduces damage risk. Such engines increase temperature inside the room during operation, which may overheat other devices. In order to prevent such situation, there are air conditioning and ventilation systems installed in base stations. With iMod you can monitor and control the installation - you can also regulate the temperature inside. You can monitor the tank content - in case of low fuel amount a supervisor will receive a text message (due to built-in GPRS/3G modem). iMod will also react to sudden increase of fuel consumption (it can be a sign of a leak or theft). it can be sent directly to external servers or databases. 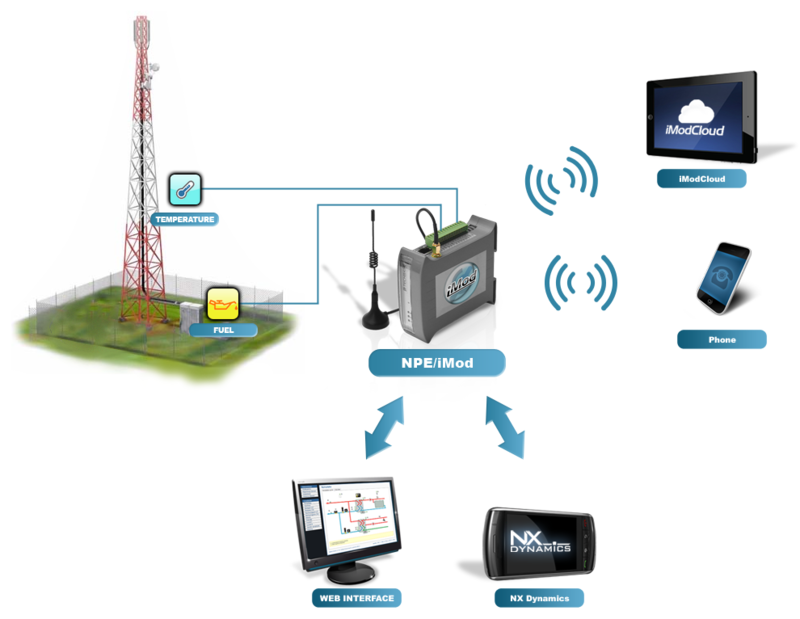 Due to a built-in web server or dedicated web-based graphical interface - NX Dynamics the data collected on the device can be easily shared in a graphical or tabular form with people supervising a BTS. iModCloud allows to manage all distributed iMod devices as if they were in one network - providing the highest standard of data security. The iModCloud service offers you the possibility to monitor all your devices from any place in the world via the Internet - you can use a mobile device like a phone or a tablet. Constant supervision over proper functioning of a BTS reduces the risk of damaging transceivers and helps to maintain constant GSM communication.